E-Bike News: Hydrogen Fuel Cell, Mainstream Media, E-Bike Share Program & More! 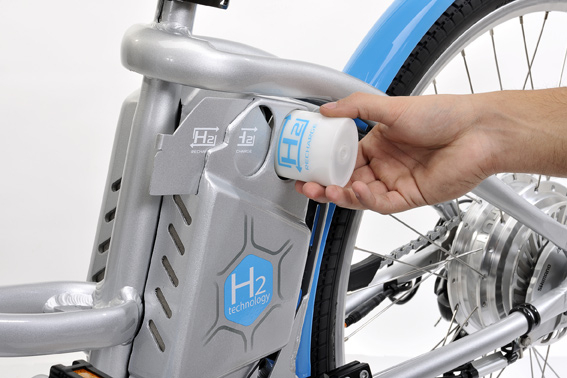 A hydrogen fuel cell powered e-bike called the Gitane Alter Bike uses replaceable (and recyclable) energy cartridges that eliminates the need for a traditional charger! This system would allow you to travel long distances by installing new cartridges. You wouldn’t have to wait for your battery to charge. Pretty interesting…. A writer for the LA Times recently got a Pedego City Commuter and has realized the benefits of e-bike commuting compared to commuting by car. This kind of mainstream media is great for getting more people excited about e-bikes. Electric bikes facing tough times in New York City. Guest post by Gary M. Kaye. Electric bikes, or e-Bikes, are illegal in New York State. Because they have motors they do not qualify as bicycles. Because they cannot be registered with the Department of Motor Vehicles they are not vehicles.